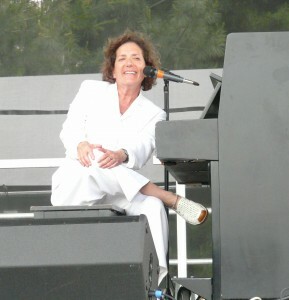 I first met Julie Gold in 1979. I’d been doing A&R for Arista Records for about a year and although we were on opposite sides of the desk, we were more alike than different: a couple of twenty-three year old music-loving kids from Philly trying to make it in New York. At the time, my office was filled with boxes of cassettes and reel-to-reels that I listened to by day. Four or five nights a week, I went to clubs to give Clive Davis and my other bosses reasons to turn down artists that big shot lawyers and managers swore were the next Bruce Springsteens and Carole Kings. Julie was just getting started as a professional songwriter and though her voice was a little unsteady, her songs were good. After our second meeting, I forwarded a tape of her best material to Clive. I felt a little bad a few weeks later calling her with his response but she wasn’t at all discouraged. Julie was different from a lot of the people I was meeting. For one thing, she was an ambitious artist who wasn’t a narcissist. She was also gracious, genuine and had a sense of humor about what we were doing. If I had to guess then, I would have put money on her being in the music business for life. That she would someday have a hit or perhaps several hits was also, in my opinion, likely; but an enduring, pop classic, I would have bet against. In my limited experience, those came from people with names like Gershwin, Berlin, and McCartney. Six years later, she wrote From A Distance, which besides winning a Grammy for Song of the Year in 1991, has been recorded by countless artists including Bette Midler, Nanci Griffith, the Byrds, Donna Summer, Jewel, and Sinead O’Connor, inspiring people all over the world, echoing knowledge that resides and is deeply resonant in every human. This summer, Julie and I revisited our friendship and the subject of music and songs in a series of emails. Tell me about your musical ancestry. How did you find your calling? Both my parents had musical souls. It was of the utmost importance to them that both my brother and I learn an instrument. I started piano lessons in first grade. I took cello from 3rd to 6th grade. For my 4th birthday, my parents took me to see My Fair Lady. We first went to Horn and Hardarts for dinner and these beautiful ladies came over to our table to compliment my brother and me for being cute and well behaved. My father told them it was my 4th birthday and we were going to see MY FAIR LADY. As luck would have it, they were in the chorus. They asked where we’d be seated in the theater. When the performance was over, the beautiful ladies waved out into the dark. In those days my parents would buy 2 orchestra seats and 2 balcony seats because A) It saved money and B), my brother and I would get to experience the show from 2 different vantage points. Of course I know now that they could never have seen us through the footlights, but then it felt like they really were waving to us. To this day when I hear the overture to My Fair Lady, I cry. I also cried the entire next day because I missed all the action and characters so much. My mother called my father at work so he could explain to me that he would take me to the theater any time I wanted. And for the rest of his life, he did. A few years later, my brother had a pen pal in England who told him about a group called THE BEATLES. We were ready when they played the Ed Sullivan Show and that Sunday night in 1964, we sat on the edge of our parent’s bed and all our lives changed forever. At some point, I remember wondering what songs were, where they came from, and who wrote them? I wondered what made a person a “songwriter.” I remember saying to myself, a songwriter is a person who writes song. I will try to do that. Could you describe what it’s like to write a song? Why do you think this happens only to some people? I am someone who is lucky enough to have a calling, that being whatever it is you’re good at, what you do for love, your art – whether it’s parenting, teaching, singing, or sports. I practice it enough to become decent and can produce reasonably consistent quality. I sit at my instrument and I trust what I’m doing. I do it for love but I start with my brain because my brain has been conditioned to know what to do. It goes, brain, heart, hand for me most times. However, there are times when an impulse happens in the heart. I am not a religious person, but I do believe in God. Sometimes, I almost feel the hand of God on my shoulder, entrusting me with a mission, choosing me. I have to be open to it. I have to keep those dream nets open at all times. It’s rare, but when that hand of God rests on my shoulder, I’m called to produce something from heart through brain to word or deed or action. It has only happened to me a few times and I know it’s a gift. I don’t say I know God or I’ve spoken to God or I’ve seen God. I’m just saying that every once in a magical moment, the hand of God has rested on my shoulder as I sit at my piano and I’ve been entrusted to deliver a song. It comes naturally and reverberates on the paper. It practically writes itself. Sometimes I use words I’ve never used before. And I look them up and they’re right. It’s a sacred moment. I think a champion swimmer, a painter, a scholar would all probably have a similar take on those magical moments where you win, you create, you achieve, you discover, you deliver. That’s what I mean when I talk about being “given” a song. I hope it happens again some day. I always kiss the keys when the process ends. What role does music theory play in being a composer? Did you learn that long ago and forget about it? Is it part of your practice? 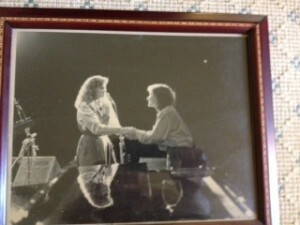 To this day, in my mind, my piano teacher, Mrs. Goldberg, is beside me (to my right) on the piano bench. Always. Sometimes she would play along in the upper register. Sometimes she would pat my back to the rhythm. Always, she would inspire me and show me how to improve. Alas, that was classical music. I was never a good reader. If I was lucky enough to practice the day I got home, I’d retain the melody and be able to take it from there. I was dedicated, I loved it, it fed my soul, supposedly I was decent. But then, my big brother turned on the AM radio in my mother’s car and that was the end of that. My heart and soul turned to pop music and figuring out songs. Pop music hijacked my classical aspirations. Happily. So I have no theory. I can hardly read (unless it’s a song I already know and love.) At best, I’m a mediocre pianist, but I love, love, love it. When I see a piano across a crowded room, my heart goes pitter-patter. Really though, my piano playing suits my purposes alone. I do sit at the piano every day and play scales, arpeggios, along with an array of songs, original and others, just to keep my “chops”… However mediocre they are. I’m curious about editing. You’ve said some songs are like gifts and come all done. Do others appear as fragments and if so, what tips have you developed or learned for nursing something along and preserving the magic? I think “finishing” a song is a very intuitive thing. You just sort of know when it’s done. I guess a baker just knows when the soufflé is done. A painter just knows when that last stroke has been applied (or if he/she should cover an errant stroke). For me, if I can just get a great first building block, then I’m committed. Whether it’s a musical phrase that somehow “registers” with me, or whether it’s a strong lyrical phrase that I feel needs to be expanded. That’s all I need. The “keystone.” I can build a house once I have the foundation. When I’m writing a song, it consumes me. It burns through my brain day and night no matter what I’m doing. If I’m swimming or talking to someone or sleeping, it’s the only impulse running through my brain. Even if it seems that I’m talking or engaging or watching a movie, all I’m thinking about is my new song. Like The Coney Island Cyclone, it literally rattles and races through my brain. Over and over and over. Because if I’m not just writing it, then I’m also learning it to put it on tape. Better and better until it’s best. When it’s best, it’s done. Every now and again, I’ll hear someone else do a song of mine with a word or musical change and I say, “hmmmm.” I like that better than what I wrote! And I might even adopt it for my own use. It’s never a big change, just a subtle one. Also every single live performance is slightly different so a song is a living thing. Be it immortal of short-lived, it bounces through the universe catapulted from the heart. It either flies off into oblivion or bounces from star to star to star like a happy pinball forever. What was the keystone for From A Distance and when did you know you had something special? Does writing a classic — something that touches so many people in so many ways — bring any special responsibilities or possibly even a burden? I was a dedicated fisherman. I loved my pond (pitching to great singers), I loved and trusted my bait (my songs). I knew my boat and my fishing rods (my “method”. Never fancy just sincere.) I loved and adored the whole process. The inspiration, the practicing, the writing, the demo-ing, the pitching. I did it day after day, year after year. I believed in it. I “fished in a humble pond” and God granted me a whale. That whale? From A Distance. I don’t know why I was chosen to “reel it in”. I don’t know why I was the messenger. Yes, I know I wrote it but I’m not sure why the miracle happened. And it is a miracle, nothing less. Clive Davis even rejected From A Distance, but the miracle still happened. Why? Why me? That song has enchanted my life. It freed me. It boosted my respectability as a musician. It gave me entree to people and places I never ever would have met or traveled. It wasn’t just a hit. It didn’t have a limited life span. Kids today still sing it in school. It was recited into the Congressional Record! (Imagine how much that matters to the daughter of an immigrant. Words can’t explain.) It’s been illustrated as a children’s book. It’s in music boxes. It’s been a greeting card, a calendar, an animated stuffed teddy bear sings it! I’m not sure where it came from. I was a very impressionable child of the 60s, like you. So you know what we witnessed. The first “televised” war. The civil rights movement with people being hosed and threatened by dogs. The man on the moon. The Beatles. Women’s rights. All of this is in the mix. The next morning I went down the ladder, sat at the piano and out poured From A Distance. It took a few hours, but it also took 30 years. No burden whatsoever. Just a miracle. I know how lucky I got with From A Distance. And I have been very conservative with my finances, so hopefully I’ll never truly have to compromise myself for my music. If From A Distance hadn’t freed me financially, I’m sure I’d still be a secretary at HBO (or somewhere) and outside of work I’d still consider myself a songwriter and I’d still be pitching my songs and making my music hoping for a “break” at any age. Nothing would have changed. I have never been able to be anything other than who and what I am. At the end of our exchange, Julie was, as always, gracious, thanking me for the opportunity to answer questions and reflecting on our shared path. I love that we share that magical history when a song was a song and a singer was a singer and when the two were matched perfectly, magic occurred. I think those days are gone and I’m an ancient relic now. But I still believe in my method and I’m still willing to die trying. You gave me hope in my earliest days of pitching. That hope went a long way.